Although our members give up their time and vehicles voluntarily for free, we have a number of operational costs to keep the group running and ensure that our members have the specialist equipment they need in order to operate effectively in tough conditions. The group would like to thank the following companies and individuals who have contributed in making YR4x4R the success it is today. They have voluntarily donated, discounted and assisted the group with their time and resources in order to ensure we can safely and professionally equip and train our volunteers in our role of logistics support to the emergency services. If you would like to donate to our group you can also do so using the PayPal button to the bottom left of this page. These companies or individuals have sponsored Yorkshire 4x4 Response with resources and equipment. Their aims are: To protect life and property; and to promote the safety of the public generally, or of any section of the public and or members of the public in the British Isles and throughout the world, in each case against disasters whether such disasters are naturally occurring or are man-made, involving multiple deaths or injury or extensive destruction of buildings or property, which occur in public places and whether by land, water or air. YR4x4R would like to thank Community Resilience for the donation of 1000 hi-visibility jackets to 4x4 Response UK. Flatdog UK Ltd are a family run company based in Gainsborough Lincolnshire. They manufacture a host of products under the Flatdog brand including the now world famous flexi arches. YR4x4R would like to thank Flatdog UK Ltd for the donation of 2 storage boxes. Tele-Products Ltd was established in 1988 as a manufacturer of test instruments and 24 years later we are proud of what we have achieved. Amongst our many customers we can list household names like BT, Sony, Panasonic, Cancer Research, British Heart Foundation, Dell computers and Fujitsu amongst others. Our products are in use in many corners of the world from Denmark to New Zealand, from China to South Africa. Tele-Products Ltd trades as First Stop Safety and Crucible Technologies. First Stop Safety supplies everything you need for Portable Appliance Testing. We help companies save money by testing in-house or generate an income by testing for others. Crucible Technologies supplies innovative products to business. Our range includes test instruments, energy monitoring equipment and caller ID solutions. These companies or individuals have offered our members support. Skytag GPS tracker is an exciting new, comprehensive stolen vehicle location service that can locate and track your vehicle anywhere in Europe, within metres. This Monitoring system is the only system to provide direct Police access to live, real time location data. This unique feature speeds up the recovery process and enables the Police to monitor the vehicle from a distance, reducing the chance of a high speed chase and damage to your vehicle. 4x4cb.com specialise in CB Radio equipment - mainly to 4x4 and farm users but also to the motorhome, car enthusiast and motorcycling fraternities. Whether on or off road, CB radio communication with your friends, travelling companions or workmates will increase your fun, safety and convenience! L. R. Series - Specialists in Land Rover, Land Rover Series and Range Rover - Gearbox, axle, transmission parts, spares and major units. JGS 4x4 is a long established family run business specialising in quality Land Rover parts and accessories. Sureterm Direct is one of the UK's leading specialist insurance intermediaries with a wide range of policies at discounted rates. They aim to provide great insurance policies for our customers - backed up with superb service and a competitive price. Birmingham Motor Parts - Specialist suppliers of Japanese four wheel drive spares and accessories. The IntaLight is a compact, 360 deg. emergency warning light, with high-Intensity flashing LED’s. Visible at night for up to a mile or 10 miles (air). It’s fully waterproof to a depth of 20 metres, and so tough it can be run over by a vehicle and still function! Famous Four are proud to supply Land Rover and Range Rover parts, spares and accessories from our base in Lincolnshire. Famous Four offer full workshop facilities for Land Rover servicing and repairs. They also offer quality pre-owned Land Rovers for sale, specialising in Land Rover 90, 110, Defender and Discovery models. 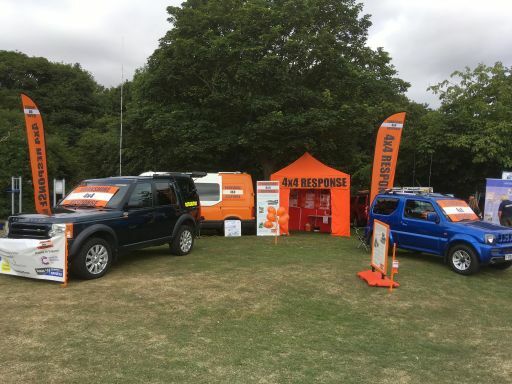 Securefixdirect are suppliers of high quality, low price goods providing caravan siting equipment, agricultural and forestry hardware, marine hardware and fittings, lashing/lifting and towing equipment and theatre equipment. Please note these are external links, we are not responsible for their content, use at your own risk!